For my last two weeks in New Zealand I stayed at Paynes Ford, one of the country’s most popular climbing venues and the only one to have a fully dedicated campsite with a pizza oven, fire pit and toilet in a tree. On my first night I met Daniel. He had the quiet confidence of someone who knew he belonged, looked early fifties-ish (hard to place), and wore a straw hat. He said that he and his partner Vanessa were practicing for retirement by living in a campervan together but that he’d been chucked out for a few days. The next day Daniel was on sighting 22 routes (6c) despite not having climbed in a year. That’s a pretty good sofa-to-rock performance in my books. I was suitably intrigued. It soon transpired that Daniel is a designer for Arc’teryx, and remembers when the brand was just a team of five. He’s a member of the old school of designers, making all patterns and prototypes by hand which he prefers over computer aided design. 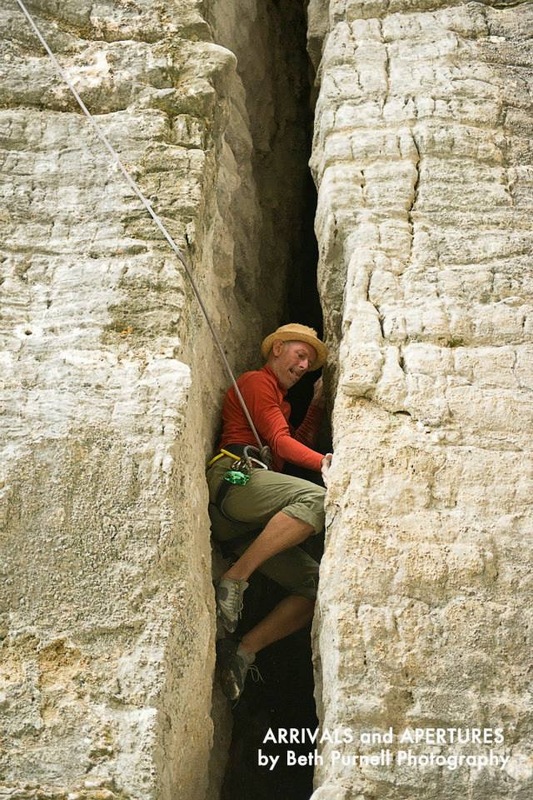 He’s also a climber, caver, wine lover and paddler. When at work, Daniel likes to sit alone in a corner of the office absorbed in one of his projects. He’s so good at this, he’s managed to persuade Arc’teryx to let him have five months off a year (actually I think he persuaded them to let him work a paid three day week, then work five days a week, banking the extra days as paid holiday). Recently, he designed the Aperture chalk bag. This design won Arc’teryx one of rock and ice’s six ‘Best in gear’ awards for 2014. The product team credited the chalk bag as being ‘one of those things you didn’t realise you were missing until you got it’. Characteristically modest, Daniel says the design was inspired by nothing more complicated than closing and opening bread bags. I asked Daniel how the design process worked. He explained how he gets a specification, which he generally disagrees with at least a little bit before some kind of compromise is reached. After that the real design process begins. 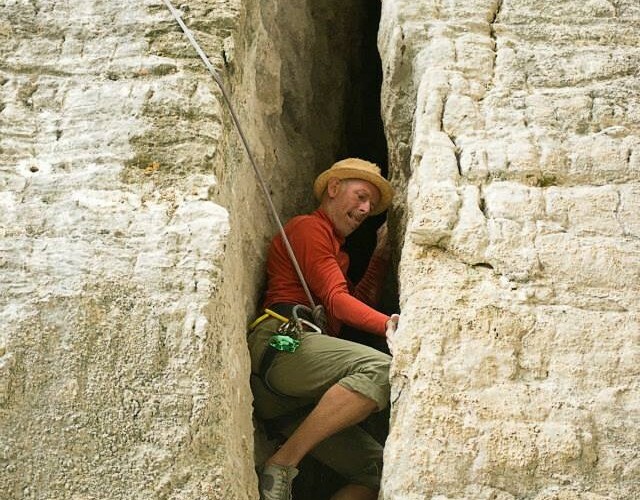 Soft items like the chalk bag or a rope bag can take a year to perfect. Something as complicated as a harness could take three. As a designer, this process can be excruciating. In Daniel’s books, to be a designer means to look at everything with critical eyes and never be satisfied with your own work or the work of others. There is significant business pressure to keep innovating, yet very quickly after product release (if not before) the outdoor market is flooded with copy-cat products. Unfortunately, most customers can’t tell the difference in quality, although the difference in price tag is easy to measure. Sadly, there’s very little the designers or brands can do about this. The lifecycle for outdoor products is now ridiculously short, so by the time a design has been trademarked it will have been replaced by a later model. Keeping going in this game therefore requires you to be a born designer, someone who, whether paid or not, will constantly be re-imagining products and problem solving. Daniel said someone once explained to him the ‘PLUS’ factor of design, something which he quite likes. It means ‘people like us’. Daniel makes kit which will work for him and his friends. As a keen caver he’s previously designed and made dry suits, the price of which made them unsuitable for the mass market but treasured possessions by the few who have them. Talking to Daniel you realise that if he didn’t design for Arc’teryx, he might have quite a serious garage industry on his hands. Whilst at Paynes, our climbing group learnt a significant amount about the evolution of the products we owned, from harnesses to rucksacks. We also heard some other great adventure stories from Daniel. On day three of climbing at Paynes, Daniel had Beth, a professional photographer and climber of one day, rigged half way up a 6b climb whilst a few of us fought our way up an excellent crack. He got a large twinkle in his eye at the sight of possibly the only chimney climb in Paynes Ford, and within half an hour our camp fire crew were sizing themselves up for a good wriggle. Naturally Daniel did it with his straw hat on and a big grin.